Spring Valley MN – May 23, 2015: (Photo courtsey of Gulbranson Photo) A jam packed pit area of 143 cars greeted the fans as they pulled into the speedway on this Memorial Day Weekend. 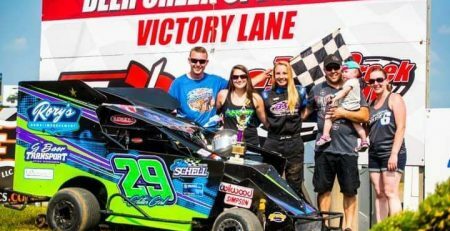 With the traveling shows of the United States Modified Touring Series and the Iron Man Stock Cars and B-Modifieds on hand along with two weekly classes the fans received their monies worth. After all preliminary races the crew reworked the track lightly creating a very smooth and fast racetrack for the drivers and very nice crowd of fans on hand. In honor of Mike Thill who passed away this winter and his wife Jan Thill who passed away two years ago from cancer friends and racers collected money to be used for hard charger awards tonight. Each class received a $200 hard charger award and the USMTS modifieds got a $300 hard charger. Additional money donated will be donated to the Join the Journey in the month of June during the paint the track pink event on the 27th. The first feature of the night was the USRA Iron Man B-Modifieds with Cory Crapser jumping out to the ear ly lead from his front row starting spot and that was the end of the race for the win. Cole Denner started on the pole and hung tough early with Kylie Kath racing him hard. A mid race restart saw AJ Zvorak move into the second spot. Dakota Foster ran hard and worked into the third spot from his eleventh starting spot. Waukon Iowa’s Matt Jones worked into the fourth spot while Eddie Schwope III made the trip from St. Joseph MO worthwhile as he entertained the crowd by charging from eighteenth to finish in the top five also collecting the hard charger award. Heat races were won by Ben Moudry, Andrew Bleess, Cole Denner, Cory Crapser and Kylie Kath. The KIK Graphics WISSOTA Street Stocks were up next for their feature event. Bernie Adams led from the start and looked strong early. Nick Schwebach and Danny Richards battled hard early on for second and on lap nine caught the leader with Richards flying around the outside to take over the lead. Schwebach settled into second with Mike Blowers, Noah Grinstead and Adams rounding out the top five at the finish. 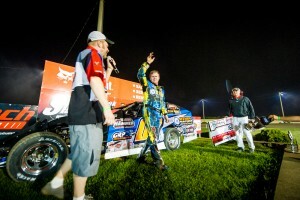 Zach Elward came home sixth after starting fifteenth taking home the hard charger award. Heat races were won by Richards and Adams. 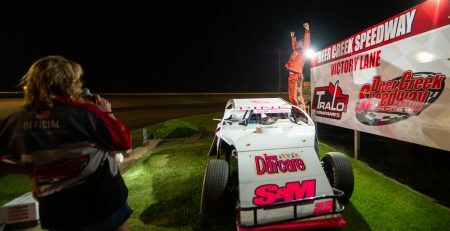 Tom Schmitt took the advantage of the pole position to win the USRA Iron Man Stock feature event after holding off heavy pressure from Derek Green over the last few circuits of the race. With only one caution the field ran the lower side of the speedway for most of the feature event with many side by side and three wide battles early on in the feature. Lynn Panos worked patiently through the field coming in third from his twelfth stating spot. Decorah Iowa racers Kyle Falck and Kevin Donlan roun ded out the top five at the finish. Another Decorah Racer Bryan Webb worked up from his twenty second starting spot to finish eleventh and take home the hard charger award. 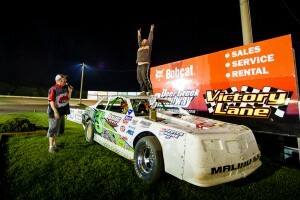 Josh Bartel briefly held the lead in the Brauer Roofing WISSOTA Super Stock feature event. AJ Hoff took the lead on lap two with Jeff Brauer holding the point on lap three Tommy Richards sliced through the field on lap one and by lap two sat in the third spot and on lap four took the lead away from Brauer and cruised out front for the win. Brauer and Hoff followed Richards home across the line, while Ryan Siegle and Dave Solum rounded out the top five. 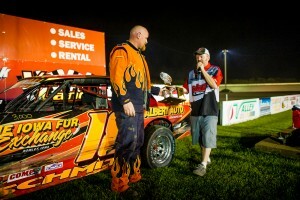 Richards also took home the hard charger award. Heat races were won by Schatney Sanders and Brauer. The final race of the night was the one that the fans were all waiting to see. Local drivers Nate Wasmund and Brad Waits sat on the front row with Brandon Davis an d Brent Larson behind them. Wasmund and Waits ran side by side for the first lap until Waits took control of the spot on lap two. Davis and Larson were side by side early until a caution flew on lap nine with Davis pulling off under the caution. Waits was unchallenged for the top spot throughout the rest of the race but after the restart Lucas Schott worked into the second spot and followed Waits the remainder of the event. Never seriously challenging for the lead but close enough to take advantage of any mistake. With most of the drivers up on the top side of the speedway a few slowly made the bottom work with Rodney Sanders having the most luck of it working past Wasmund and Larson late in the race to take home the third spot along with the hard charger award from moving from thirteenth to third. The exciting heat races were won by Larson, Dereck Ramirez, Davis, Zack VanderBeek and Schott with Sanders and Keith Foss taking home the “B” features. Racing action resumes next Saturday with action in all five classes at the speedway. Start time will be 6:00 through the rest of the spring and summer. 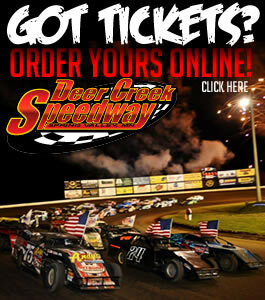 Feature – Danny Richards, Nick Schwebach, Mike Blowers, Noah Grinstead, Bernie Adams, Zach Elward, Brent Holland, Brandon Vogt, Fred Prudoehl, Tyler Wahlstrom, Danny Hanson, Troy Voth, Kory Adams, James Connors, Karl Hewitt Jr.